One of Android’s strongest features that isn’t found anywhere on iOS is how you can share an item inside an app with any other supported app on your phone. Saw an interesting link through Reddit News Free? Share it via Twitter, Bluetooth, NFC, Facebook, Dropbox, Email, Read It Later etc. etc. I was absolutely satisfied with this feature until today when I discovered Andmade Share – an app/tweak that replaces stock Android “Share”. Check it out after the jump! 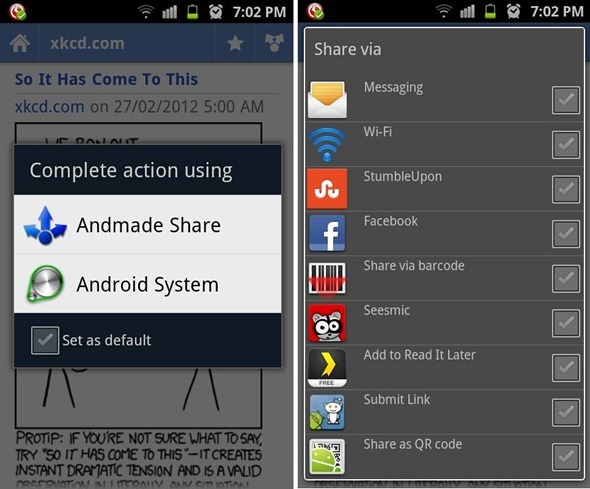 Andmade Share replaces the system "share menu" list. – Share to Multiple Applications at a time: use checkboxes -> tap one of checkboxed elements. – Reorder List: long tap -> drag the element up or down. – Fast share to Evernote. 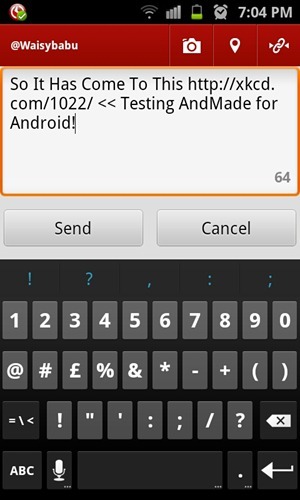 We’ve tested Andmade Share on a Samsung Galaxy S II (Android 2.3 Gingerbread) and can confirm that it works as advertised. Andmade Share has no complexity about it. All it does is replace Android’s stock Share menu and allow you to do two very useful actions: share an item with multiple apps in one go and customize how the apps under the share menu are listed. Launching the app itself for the first time presents you with a simple introduction to Andmade Share’s features and how to use it. After installing, whenever you attempt to share something, Android will ask you which app you want to use to share said something. You have to enable Set as default and then tap on the app’s icon. You will then be presented with a list of apps you can share the item to; here on you can tick checkboxes and then, finally, you have to tap on any one of the chosen app’s icons to initiate sharing process. Andmade will launch each app sequentially and let you share whatever it is that you are sharing. These features will only appeal to those of you who are what are called shareaholics. I’m one such person; whenever I come across an interesting link whether it is a picture of a funny cat or a novel new app for Android, I tend to share it with Twitter, Facebook or via Gmail. Because of the way it enhances sharing on Android, Andmade Share has been inducted in my list of must-install-after-refresh apps. Andmade Share is a free app and can be downloaded from the link embedded below.